Ferrari doesn’t want to publicize its Portfolio-program. But like the first, their second official Portfolio-car has now been snapped. 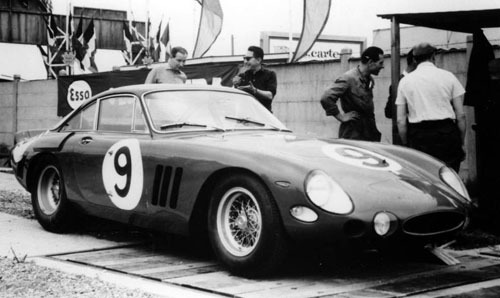 And its gold inspiration came from a Le Mans-racer that was rebodied for a Fellini-film. After the first car – the Ferrari SP1 by Fioravanti – it is now Pininfarina who comes with an official Portfolio-Ferrari. Thanks to a peeping Tom that was invited to an exclusive Ferrari-event in Monaco some shots of Ferrari’s second Portfolio-product have come to the light. The photos of the mock-up you see here were sent to our friends at Autoblog.nl. The car is based on a 599 GTB - of which initially was said it was not to be used for the Portfolio program - and has not been shortened. 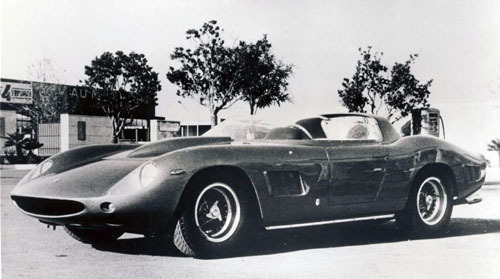 Its new spider body has been inspired by an unusual Ferrari that was bodied by Carrozzeria Fantuzzi in the mid sixties. 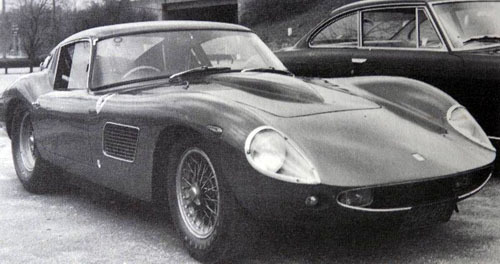 Fantuzzi's golden Spider body was first installed on the chassis of 330 TR LM #0808TR in 1963. 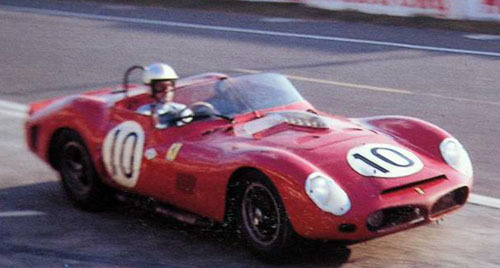 Shortly after, in 1964, it was taken off and constructed onto #4381SA - originally one of four 1963 330 LM Berlinettas with cool racing pedigree - which was owned by film company Crossograph SpA. The spider received a striking gold paint job and was used extensively by actor Terence Stamp in one of Fellini’s more eccentric films, ‘Histoires Extraordinaires’ of 1968. See the car in action by clicking here. 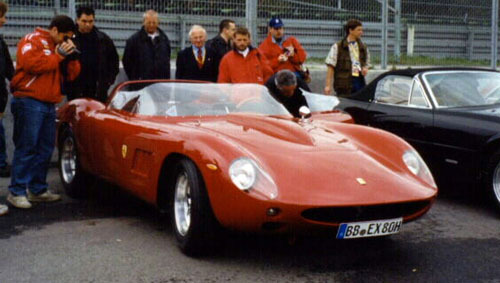 Chassis #0808TR received a new Coupe body by Fantuzzi and in the late seventies #4381SA was reunited with its original LM Berlinetta-body, but the ‘Golden Fantuzzi’-bodywork was kept and fitted to another Ferrari. This time 330 GT 2+2 #8733 of 1966-vintage. And although in red, it exists to this day. See more images of the Golden Spider on the three different chassis in the gallery. Walmart-owner Rob Walton, who approached Ferrari for a modern makeover, must have liked the Fellini-film a lot. He ordered them to build a car in a similar body style, ending up with Pininfarina to perform the job. 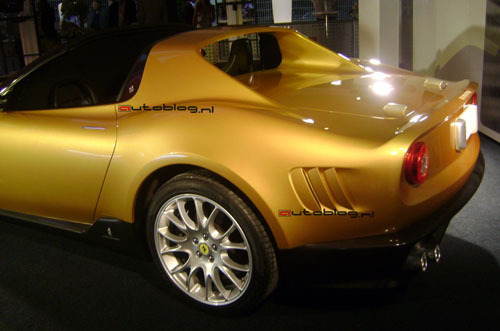 The new ‘Golden Ferrari’ is a modern interpretation of Fantuzzi’s 1963/1964 original in everything, not just color. The air vents in the sides, roll over bar, truncated tail with round rear lights and the classic chrome Ferrari-script on the rear. Even the rear boot lid hinges were copied from the original. Exterior features that have unfortunately not been copied are the pointed nose with massive air bulge and the perspex side screens. Also the very low windscreen didn’t make it to the new interpretation – the original screen and its surround were kept. The head lights look like they're taken from the Ferrari 612 and the rear lights are standard 599 GTB. The Challenge-wheels are also off-the-shelf. 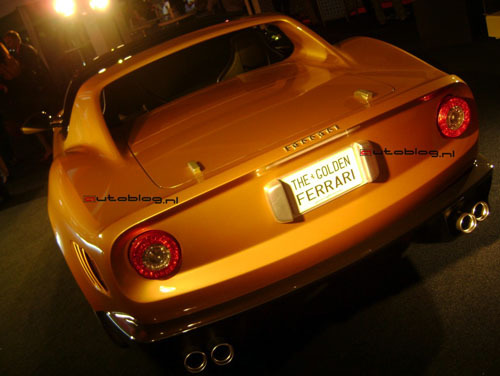 The ‘Golden Ferrari’ is the second car born out of Ferrari’s official portfolio-program, but a third and fourth car are underway. 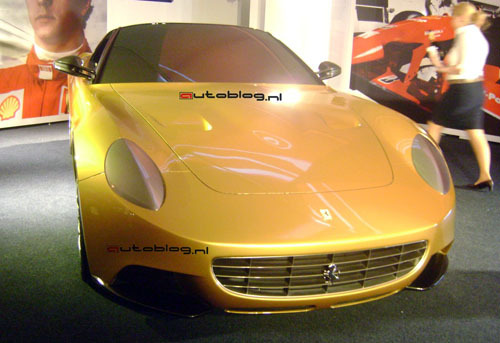 One of these is also based on the 599 GTB and, like this one, has been inspired by a Classic. 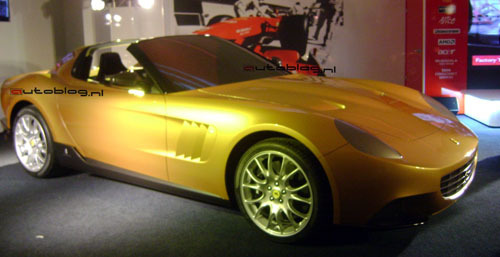 The fourth Portfolio-Ferrari is just about the opposite and will come in an extremely modern look with gullwing doors. The base for that car? It’s the Ferrari FXX.